Think the grill is just for protein and veggies? Think again! This spring and summer, you can prepare an entire feast on the grill, from appetizers and drinks (yes, really) through to a main course and dessert. No need to waste this gorgeous sunny weather slaving away on the stove inside; embrace true al fresco dining and treat friends and family to a smoky smorgasbord of dishes prepared entirely on the grill. An ice-cold refreshment is always welcome when enjoying the sunny outdoors. Try these smoky, grilled citrus margaritas, which get a tangy boost from the grilled lemons and limes. Swap out some of the tequila for mezcal for a more dynamic taste, or simply make them virgin: the stand out flavors here are the grilled citrus fruits, so put them front and center. 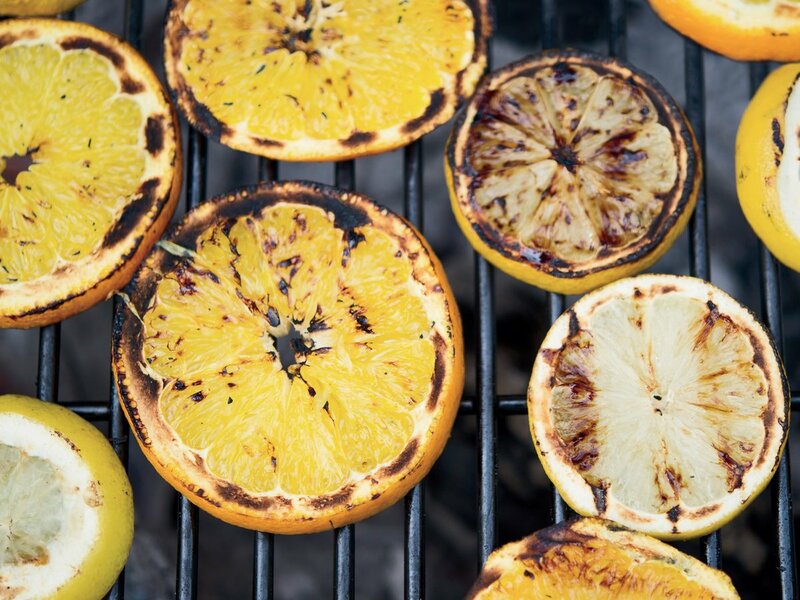 Try the recipe: Grilled Citrus Margaritas from Food & Wine. This simple, crowd-pleasing Italian appetizer was made for the grill. And because bread, tomatoes and lots of garlic can’t steer you wrong, feel free to think of this bruschetta recipe as more of a template. Grill the tomatoes, sure, but don’t stop there. Feel free to bulk out this recipe with grilled eggplant, zucchini or bell pepper. Brush baguette slices with a little garlic-infused oil before slapping them on the grill. Feel free to grill scallions, garlic or any other seasoning you want to add to the bruschetta. Once everything is cool enough to handle, mix it up, drizzle with olive oil and balsamic and top with your favorite cheese, if desired. Just don’t forget the basil! Try the recipe: Bruschetta from Food Network. Keep the Italian theme going with this grilled Tilapia piccata. Grilling juicy, tender Tilapia over a high-heat yields a delectable firm flesh that readily absorbs any flavor with ease. This recipe is a snap, but feels decadent and fancy. The zesty, light fish dish incorporates lemon juice, olive oil, garlic and capers, and is ready in just 25 minutes. And the clean up: what clean up? You won’t need to worry about a sink full of dirty dishes with this minimalist meal. Serve it with your favorite grilled side dishes, like grilled asparagus, charred bell peppers or any one of these five creative complementary dishes. Try the recipe: Grilled Tilapia Piccata from Taste of Home. Here’s a lesson in flavor dynamics: something super sweet pairs well with something savory for an over-the-top taste sensation. For example, take these grilled peaches: simply throw them on the grill for a few minutes and the resulting char will bring out their natural sweetness. Top them with a scoop of premium vanilla ice cream and a drizzle of honey for a unique dessert that will have guests begging for seconds… or thirds! Bonus: this delicious dessert is relatively healthy, as it’s packed with nutrients and fiber from the peaches. Guilt free dessert is the best dessert, after all. 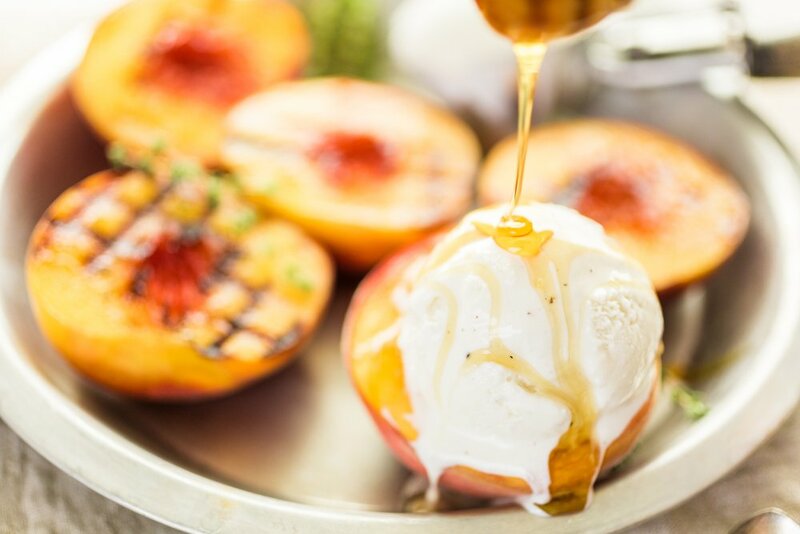 Try the recipe: Grilled Peaches with Vanilla Ice Cream from What’s Gaby Cooking. And because one dessert is never enough, why not whip up a second? Banana splits are a treat as old as time, but adding some char marks is a great way to take things up a notch. With so much natural sugar, bananas easily caramelize when tossed onto a hot grill, making these grilled banana splits even more complex. Serve them with some ice cream and chocolate sauce for a little extra decadence. Try the recipe: Grilled Banana Splits from Delish. The next time the sun is out, challenge yourself to a whole night of delicious foods created entirely on the grill. After uncovering the possibilities, we guarantee you won’t be able to stop grilling until next winter. Want to find the best fish for your grill? Be sure to have a word with your grocer. Photo Credits: Food Network, Food and Wine, Charles Brutlag / Shutterstock Inc., Arina P Habich / Shutterstock Inc.